No One Is Wise Other Than A Teacher - Happy Teachers Day! Why Do We Celebrate Teachers Day? When people remember individuals who have helped them, teachers are often at the top of the list. Teachers shine a light ahead to places that students can’t yet see: a place where students find their unique talents and use them. Shall we try to count the ways teachers help students to reach their potential? A teacher doesn’t just provide lessons and grade tests; a teacher is also a cheerleader, a psychologist, a crowd-control expert, a motivational speaker, a nutritionist, a literacy advocate, a nurse, and a recipient of shiny apples and the pure love of a grateful child. Besides the usual note-passing, spitball, teachers need to know how to handle the greater challenges that come with 21st-century living, like the use of social media, family crises, and explaining complex world events. But most importantly, teachers give unwavering friendship and support to the students who pass through their classrooms. So much has been given to us but we have no time to ponder over that which has been denied. Expressing gratitude can be simple. A warm word, a card, or just a shiny apple can show these dedicated teachers that you care for them in this Teachers Day. A teacher is a friend, philosopher, and guide who holds our hand, opens our mind, and touches our heart. The contribution of a teacher cannot be ignored at all. In many countries across the world, teacher’s day is a special day where teachers of schools, colleges, and universities are honored specially. The date varies from country to country. The universally accepted World Teachers Day is 5th October. In India, the Teacher’s Day is celebrated on 5th September and this tradition started from 1962. This is the when Dr. Sarvepalli Radhakrishnan was born. He was a philosopher, scholar, teacher, and politician and his dedicated work towards education made his birthday an important day in the history of India. We remember the great work of this exemplary person on this day. The first Teachers’ Day was celebrated in 1962, the year when President Radhakrishnan assumed his office. Radhakrishnan was the first vice-president of India and succeeded Rajendra Prashad to become the second President of the country. On September 5th of 1882, Radhakrishnan was born into a Telegu Brahmin family in Tirutani in Andhra Pradesh. He did his Masters’ in Philosophy from the University of Madras. And later, went on to teach in University of Mysore and University of Calcutta, where he was also popular among the students. Radhakrishnan also served as the Vice Chancellor Andhra University and Banaras Hindu University. He was also called to take the Chair of Spalding Professor of Eastern Religions in Oxford University. He was a staunch believer of education, and was a well-known diplomat, scholar, the President of India and above all, a teacher. After he became the President of India, a group of his friends and students requested him to let them observe his birthday. Radhakrishnan reportedly said, “Instead of celebrating my birthday, it would be my proud privilege if September 5th is observed as Teachers Day.” He wanted to do this to pay tributes to the greatest teachers of India and Bangladesh. Since then 5th of September, his birthday, is celebrated as Teachers’ Day in India. Radhakrishnan was conferred Bharat Ratna in 1931, along with several other highest civilian awards like Knighthood. He was also nominated eleven times for Nobel Peace Prize until he passed away in 1975. Teaching is the most influential job in the world. Teachers are known to shape the mind of youth and without knowledge no one can exist in this world. Teacher imparts good value in children and turn them into responsible citizens. So, almost every country celebrates Teacher’s Day. Teachers teach students very carefully and sincerely just like their own children. It is well said that teachers are great than the parents. Parents give birth to a child whereas teachers shape his/her character and make future bright. Thus we never forget and ignore them, we always respect and love them. Our parents are responsible for giving us love and quality care however our teachers are responsible for making whole future bright and successful. They let us know the importance of education in our life through their continuous efforts. The teachers are the source of inspiration to us which help us to go ahead and get success. They motivate us towards study by giving examples of great personalities all over the world. The teachers make us so strong and prepare to withstand any obstacle of the life. They become full of immense knowledge and wisdom using which they nourish our lives. Come on my dear friends, say together that ‘our respected teachers we are always grateful to you for all you do to us’. Life might have evolved a lot, with you undergoing various transformations and learning something new each day. But when it comes to the roots of our learning, we always rewind to those golden days of our childhood. Homework was an inseparable part of our school life which won us either accolades or punishments. 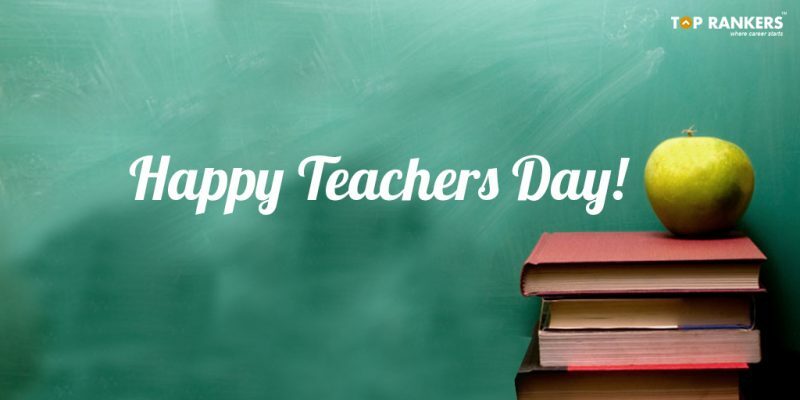 Despite the fact that more than a few decades have gone by, the day is celebrated with the same zeal and enthusiasm across India and students don’t miss to appreciate the contribution of their teachers in their life. All of us have been students at some stage of our life and have benefited from our teachers. Celebration of Teachers Day is a wonderful opportunity especially for all of us to show our gratitude and appreciation to our teachers. Such a man of course requires a standing ovation. So, to promote the values and principles of a true teacher, this day is celebrated. Let’s say a big thank you to all the teachers who have taught us, guided us and helped us become what we are.